PC-Petrifier® Rotted Wood Hardener repairs wood damaged by insects or rot. It is a liquid that is brushed, sprayed or injected into the pores of the wood. No mixing. Prepares wood for filling, priming and painting. Improve the hardness and minimize damaged wood removal. Water based formula allows for deep penetration. Window sills, frames, fences, decks, paneling, playground equipment, log homes, picnic tables, cellar doors, planking and more. Remove loose paint, wood fibers and debris with stiff brush or scraper. Wood should be fully dry. Wet or damp wood or wood treated with wood preservatives will decrease PC-Petrifier® ability to soak-in. 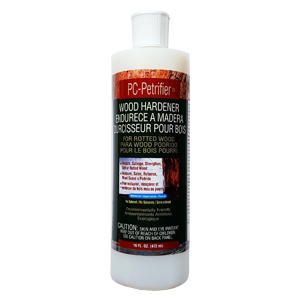 PC-Petrifier® does not displace water from inside damp wood. Ventilate the wet wood using a fan and if necessary safely warm with infrared heat lamp to speed drying. Painted surfaces must be drilled or sanded to expose damaged wood. Vertical surfaces should be drilled on a downward angle (45 degree) with 1/8 to 1/4 inch bit to access the wood grain. Clean up PC-Petrifier® with paper towels before it dries and/or cures. Water is the best solvent to clean brushes and spills or drips. Cured PC-Petrifier® can be removed with citrus based solvents. Apply solvent to loosen, then rub with a paper towel or scrape away. Paint stripper will remove cured PC-Petrifier®. The bottle of PC-Petrifier® may have been frozen. Will it still work? PC-Petrifier® has been freeze tested and it can withstand multiple freeze thaws without damage. How many treatments of PC-Petrifier® are best? Apply two treatments of PC-Petrifier®. The first treatment will penetrate deeply into the wood. The second treatment will remain at the surface and make it harder. Does PC-Petrifier® work on vertical surfaces? Vertical surfaces are more difficult to penetrate without holes to access the grain of the wood. Use a 1/8 to 1/4 inch bit to drill multiple holes on a 45 degree downward angle. Use a disposable brush to direct the PC-Petrifier® into the holes, fully soaking the wood. Can PC-Petrifier® harden RV particle board. PC-Petrifier® works well to improve the hardness of RV floors. 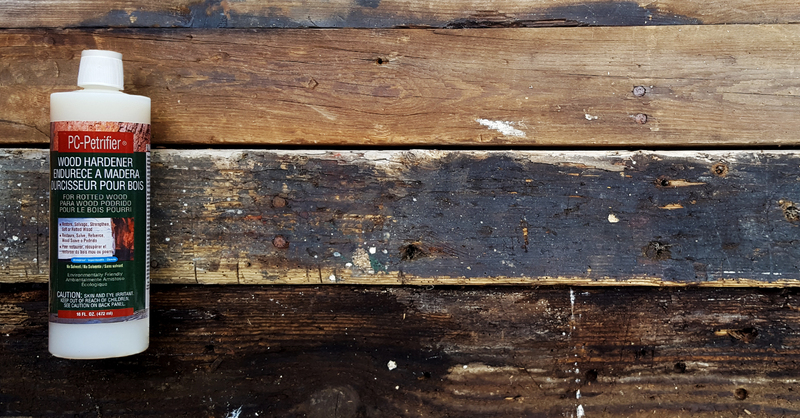 If the rotted wood is crumbling and loose, should it be removed? How much damaged wood to remove is subjective. If the damaged wood is loose and can be brushed away then it is probably worth removing some or much of it. In many cases it makes sense to remove the wood and replace it. However, if the wood is decorative or is an integral part of a window, for example, then it makes sense to harden as much as possible with the PC-Petrifier®. Rain is in the forecast. How soon after treatment can PC-Petrifier® be exposed to rain? 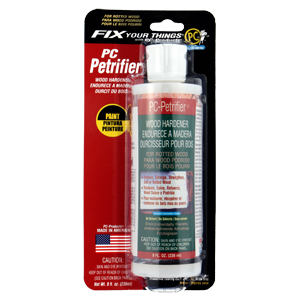 PC-Petrifier® has a water base that must fully evaporate. Do not allow the treated wood to be exposed to rain until the second treatment has fully dried. If truly needed, preventative measures such as covering the treated area(s) with a tarp or plastic can be performed to avoid saturation from rain. Can PC-Petrifier® be used on wood that is damp? PC-Petrifier® is not as effective when applied to wood that contains water. Allow the wood to dry. Protect the wood from exposure to rain. Use fans to force air over the damp wood. Use a warming lamp in combination with a fan to accelerate the drying process. The PC-Petrifier® did not harden the wood on a vertical surface. Without drill holes on a downward angle accessing the wood grain it is unlikely that the PC-Petrifier® will fully saturate the wood. The PC-Petrifier® has dripped on the aluminum siding and dried. How can it be removed? PC-Petrifier® has excellent adhesion and is very difficult to remove once it is cured. Citrus based solvents or cleaners have shown to be capable of gently softening the cured film so it can be rubbed or scraped off.